Along with the launch of a number of new tools and features at its Android Dev Summit 2018, Google has also launched the a new API, called "In-app Updates," which aims to help developers ensure that users are running the latest and greatest version of their app. "We've heard that you'd like more controls to ensure that users are running the latest and greatest version of your app. To address this, we're launching an In-app Updates API," Google said. 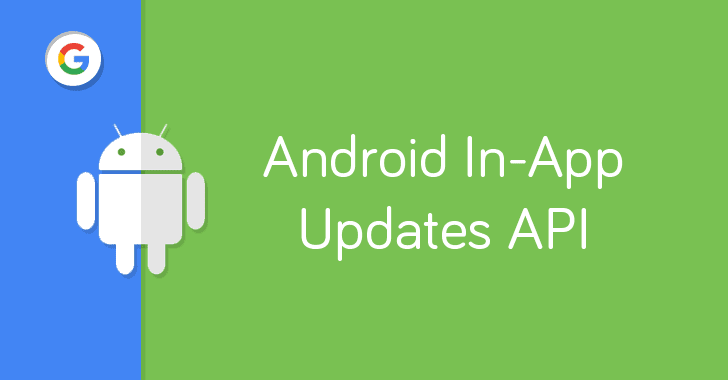 How Does Android's New In-app Updates API Work? It should be noted that the Android's new In-app Updates API doesn't force or lock out users from the app if they chose not to update it. 2) Flexible in-app update (for regular updates) — Using this option, Android app developers can display a small "available update" notification to users, giving them an option to accept it and then keep using the app while the new version app is downloaded in the background. Flexible update also gives users the "Not Now" option, which users can select in case they don't want to install the update.